Timmy Jernigan was a bit of a surprise second round pick among the Ravens fan base. The largest needs on the team were free safety and right tackle, which many thought would be addressed early. After the Ravens took an inside linebacker in C.J. Mosely with their first pick, many hoped a larger need would be filled next. The Ravens have a history of many great draft classes where needs come secondary to the best player available and the value of grabbing them much later than anticipated. Mosely was projected in the top ten picks, and could be a steal at #17. The focus here on Jernigan, a defensive tackle, was also projected as a late first round talent that the Ravens selected mid second round. Jernigan was likely on the top of the Ravens draft board when they went on the clock, but will the value pick pay off here? I’ve looked at the tape, here’s what I see. Discuss your thoughts on this topic on our message board. Also, from now through July 1, if you like the content here, check out how you can help BSL grow while supporting local charities. His strength is likely good, but not great. The top of the DT class, Aaron Donald and Ra’Shede Hageman benched 35 and 32 reps of 225 respectively at the combine. Jernigan benched 27. His vertical also falls short as Hageman put up a 35.5” mark, Donald at 32”, Jernigan with 29”. Broad jump, Donald and Hageman out jumped Jernigan by over a foot. I take combine results with a grain of salt, but I feel it’s worth noting. How players do in real games is what I’m interested in. Timmy Jernigan’s most NFL type of test was in their rivalry game with the Miami Hurricanes. Miami sent two of its lineman to the show via the draft: Guard, Brandon Linder in round three. Tackle, Seantrel Henderson in round seven. Miami also had two other members sign as undrafted free agents in tackle, Justin Renfrow and center/guard, Jared Wheeler. Unfortunately in this game, Jernigan was for the most part a non-factor. Something I noticed that could be a problem is that he seems to give in at times when a blocker had him engaged. I don’t want to say he takes plays off, but at times he’s pushed backwards a little too easily. In the tape below, #62 is Shane McDermott who manhandles Jernigan (#8), who then proceeds to jog toward the action instead of moving with a sense of urgency. McDermott, a junior, was third team All-ACC. In other words, he’s not a special talent that should be shoving Jernigan around with ease. Here is another example of poor play by Jernigan (#8). He’s standing way too tall, and slap fighting. No effort to penetrate the line, unless his assignment was as a spy. I tend to doubt the call was a two man rush with two DT spy, as one dropped into coverage. He should be trying to move forward low, especially with the OL standing tall. There are some positives in Jernigan’s game. Here he appears light on his feet as he avoids the low block, regains his balance and squares up to the ball carrier with force. Now, I’m not guy who gets worried about size. When pundits say, “He’s got short arms,” or “small hands,” can he play ball? That’s my question. Prototypical size for certain players I just don’t put much faith in. Ray Lewis was considered undersized. Drew Brees is short by QB standards. Steve Smith has the makings of a Hall of Fame worthy career while standing 5’9” at a position where taller players are at a much bigger advantage. Jernigan’s size comes into question at 6’2”, 298 lbs. Kelly Gregg played on this line at 6’0”. Arthur Jones emerged as a solid player at a similar 6’3”, 301 lbs. Not everyone on the line has to be 6’5” or 320+lbs to be a force. All in all, I think Jernigan can help in run defense and not much else. Nothing I’ve seen shows the ability to penetrate and rush the QB. Jernigan doesn’t shed a lot of blocks and really lacks a swim move to get by blockers. He relies on his strength to beat blockers, and the opposition only gets stronger at the pro level. It looks obvious upgrading run defense has been the direction that the Ravens wanted to go with their first two picks, and that’s okay. Folks will preach that it’s a passing league, but the Seattle Seahawks showed once again what continues to win in the postseason: Overall defense, running the football effectively, timely passing third. A better run defense in 2013 would have afforded the Ravens an opportunity to win two or three more games. So often the defense just couldn’t get a stop that led to the opponent earning the winning score. Or eating up the entire clock, not allowing the Ravens offense a realistic chance at a winning score on our side. On the Ravens defense, Haloti Ngata and Chris Canty are locks (barring injury) to be the starters. The Ravens aren’t a traditional 3-4 team, often called an “amoeba” defense because guys will line up anytime, anyplace on the field. At any time up to five of these guys could be on the field at once. But Timmy Jernigan could have the opportunity to earn a starting role, or the largest portion of the snaps among the other seven candidates. His chances are just as good as anyone else. But from what I’ve seen, Jernigan is not a lock to be a future contributor, or a lock to beat out any of these candidates for playing time this year either. Final thought on Jernigan. 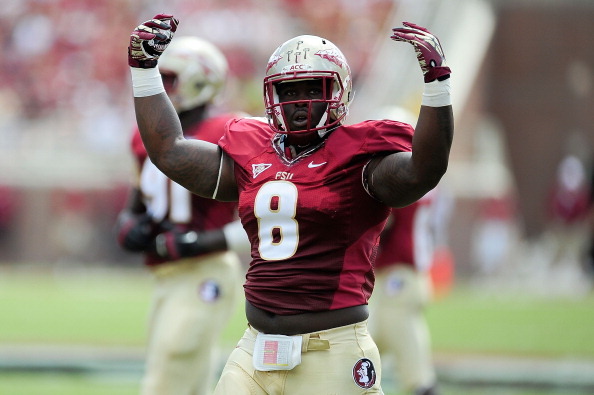 It’s hardly football related, but Timmy Jernigan tested positive for a diluted urine sample via a combine urinalysis. Simply put, Jernigan went for the most important job interview of his life, knowing there would be a drug test. Not random. A known test and still tested positive. So what do we make of that? Is there a rationale reason to explain away the dilution? Is it a question of maturity? Josh Gordon is facing a yearlong suspension for his second drug offense in the NFL. I think it is fine to select Jernigan based on his talent, but the diluted sample provides another reason for the Ravens to have a back-up plan ready.